While I admit that I'm not an avid wine drinker, every once in awhile a glass of wine really hits the spot. I recently had the pleasure of sampling a bottle of Twin Pomegranates Sparkling Wine. I'm not sure if it's "proper" wine etiquette but I have to have my wine chilled, I don't like it if it's not ice cold. Sweet and bubbly! The color is bold and beautiful. The aroma is simply delightful. 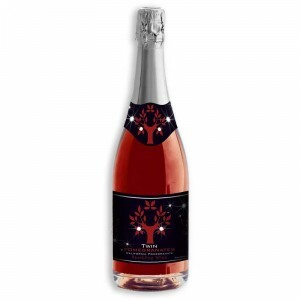 This pomegranate sparkling wine is made from 100% California Wonderful Pomegranates. It is carbonated to bring out the bright, crisp, tropical pomegranate flavors, making this a great refreshing drink you can enjoy anytime! Even better than a glass of wine (in my opinion) is a mixer recipe. The PomeJito is simply amazing! Mull 6 sprigs of fresh mint into cocktail glass. Strain the pomegranate mixture into the glass with mulled mint, stir well and serve. Your friends are going to love your new spin on the classic Mojito! To learn more about Twin Pomegranates Wine you can visit their website. While you're there you can make a purchase or sign up special offers via email. Use promo code BLOG for FREE SHIPPING! A special thanks to Twin Pomegranates Wine for this wonderful opportunity! Superpoints: Earn Points and Gift Cards for FREE! Vistaprint - 6 Free Products for Fall!